4 IN THE FLOOR 60's Drum Synth! KORG iMS20 FOR THE iPad! If this piece of perfection doesn't get you running to your nearest apple store I don't know what will...synth, drum machine & sequencer and it sounds amazing!....the iPad just gets better & better! CHECK IT OUT AT THE KORG WEBSITE! If you're anything like me...you'll have used Fruity Loops & FL Studio! Fruity Loops 2/3 to be exact has been a fave of mine for many years! having paid £99 for it many years ago!...and altho I'm not these days a regular user I still love going back to my old fave prog Fruity Loops from time to time and make some tracks, I have FREE lifetime updates and probably have every update from the last 10 years or so the later FL Studio never quite had that simple interface usability that I initially loved about the program...I bought it initially just because I wanted a simple PC based drum machine but got a lot lot more...anyway enuff of my LIFESTORY with Fruity Loops my point of this post IS they have now released a mouthwatering iPad/iPhone & iPod Touch version FL Studio mobile and I've got to be honest it looks amazing, with this and all the other great music stuff on the iPad...Korg are doing some amazing stuff! I think its now time to get out there and purchase that iPad!...altho why they have created this purely for Apple devices is a complete mystery considering Fruity Loops etc was always a PC program.....weird...but AWESOME!...! GO TO IMAGELINE AND CHECK OUT MORE INFO! RALF und Florian self built drum machine! Now how much do I wish I owned this early Kraftwerk drum creation!! !...this is from the wonderfull Ralf Und Florian album...if you aint got the album get it, its deeeeeeliceous! RARE Simmons CLAP TRAP....for sale! You are bidding on a rare SIMMONS CLAP TRAP hand clap synthesizer with a Diamond Series DS-750 Step Up/Step Down U.S. to U.K voltage transformer. The Simmons Clap Trap was made in England. This one is in very good cosmetic and working condition. All of the adjustments (volume, humaniser, delay) work perfectly. I haven't tried the foot switch or any of the other triggers so I can't be 100% positive that they work. 3 knobs are missing face plates but that doesn't affect the working of the machine. The transformer is required to use the Clap Trap in the U.S. It weighs 10 lbs. and will be shipped separately within the U.S. (by a slower and cheaper method) and will not be shipped to foreign bidders. 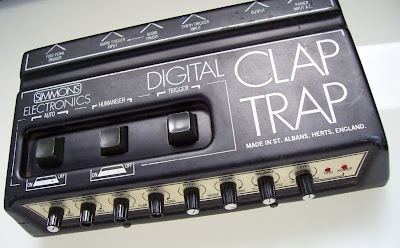 As heard on countless classic Chicago house and acid tracks, the TR 707 is still as distinctive - and fantastic - as when it first appeared over 25 years ago. Although not revered in the same way as the 808 and 909 rhythm composers, its sounds are instantly recognizable. Item is in very good condition. There are some very minor cosmetic marks but nothing that affects performance. 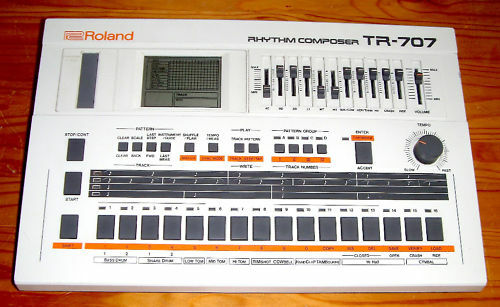 The LCD matrix screen, faders, buttons and connections are all fully functional. The battery compartment cover is missing (this is common with any of these units these days), but you can still use batteries for memory back-up without any issues. I can't vouch for the condition of the cartridge slot, as I've not used it. Does not come in original box or user manual (a PDF of which can be found very easily online, anyway), and the PSU is a suitable replacement. KAY Rhythmer VTG Model R12...for sale! Hello everyone, I got lots of questions about this machine so I went and did my homework! it does make the sound of the beats, in all of the different styles and tempos BUT: there is a constant sound coming out of the speaker - like a high-pitched, constant tone. I have no idea what that means - is it a problem with my friend's amp? A feedback situation? Something that can be fixed? I just don't know. I don't know if this is something that is happening because of the drum machine itself or because of the cord or if it's something that needs fixing or if this machine needs to be discarded completely. If you know exactly what this means, how to fix it or work around it, then it is for you. Otherwise, if there are no bids, I will assume that it is, sadly, for landfill. Please scroll down to see all photos. 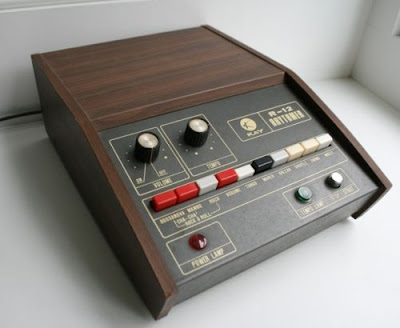 Pre-owned vintage drum machine by Kay.